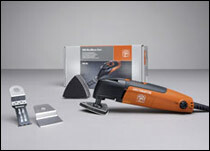 The astonishingly broad range of applications makes the FEIN MultiMaster Tools some of the most versatile and therefore most sensible tools on the market. The application range is almost limitless and will always produce professional results. For renovating all around the house, for car repairs, boat maintenance, and model building. And that's not the only reason the original FEIN MultiMaster has regularly been awarded the best marks in field tests throughout the world. 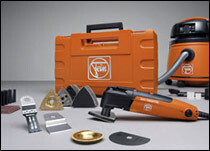 To ensure that you can make the most out of the excellent capacities of your FEIN MultiMaster for your needs, Clairton Industrial Tool & Supply offers different versions with a large range of equipment and accessories. Make way for inlets, sockets in cupboard and shelf walls using the E-CUT saw blades. For beginners, who do not want to sacrifice professionalism in spite of being price conscious. Call for pricing on different packages. For everyone, who expects professional tools and results and wants to use the complete application range for interior fittings and renovation. Call for pricing on different packages. The all-round carefree package with which all applications can be carried out professionally in interior fittings, renovation and hobbies  from floor work to renovating windows.Call for pricing on different packages. How can we make the TOP-Model even better? 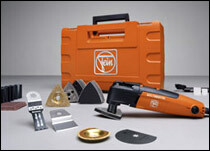 By also supplying the clean work site at the same time with FEIN Turbo I. 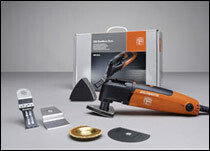 With the oscillating movement and particularly user-friendly accessories, the FEIN MULTIMASTER is an unbeatably versatile, high-precision specialist tool  perfect for all professional outfitting, renovation and repair work. 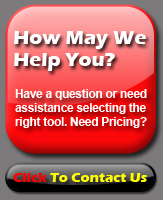 call 877-702-8665 or click here to contact us.